Goldeco stainless steel is a top-ranked trustable, and reliable cold rolled stainless steel honeycomb core supplier, manufacturer and exporter in Foshan China. 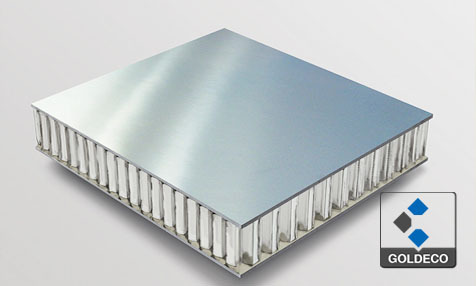 Honeycomb core creates an extremely strong but lightweight panel, which is is adhesively-bonded, and available in great variety of cell shapes and sheet sizes. we offer our customer with affordable price. It has good properties, such as lightweight, excellent moisture and corrosion resistance, flame resistance, noisy resistance, sound absorb. Due to the features it has, it has been used widely used for decorative panels, Elevator cabins, Interior and exterior cladding, joiner panels, bulkheads, train doors and floors or any areas where honeycomb is subjected to critical environments. Do you want to know how much does a stainless steel honeycomb core cost? Do you want to know where you can get the best price and buy the quality stainless steel honeycomb core? Contact us, and we are ready to offer you our quality products and fast delivery service.